Setting a goal gives you something to work towards, and putting together a game plan helps you think about how you’re going to get there and how long it’s realistically going to take. Targeting small incremental wins along the way enables you to track your progress towards the bigger goal and provides motivation to not fall off the wagon. It takes time and effort to get and stay fit the proper way. Fad diets are not sustainable and any benefits are guaranteed to be short-lived. The same goes for investing and growing your wealth, it’s about thinking long-term when deciding where to put your money and not trying to chase the latest trend. It’s not easy fighting the temptation to follow fads when investing, which is why your greatest enemy is often yourself. Getting into a habit and building momentum helps to improve results in both fitness and when it comes to saving and investing. Doing a little bit each day makes more of a difference than you think. 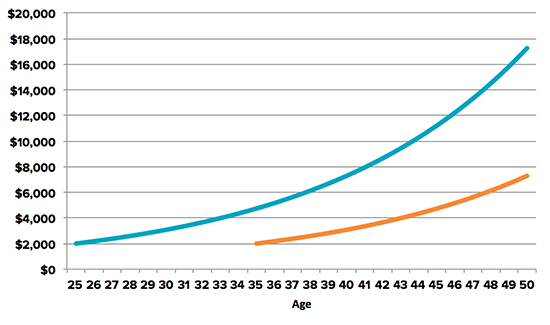 Investing $2,000 at 25 as opposed to 35 could double the profit you make by the time you’re 50. When it comes to exercise, try not to do the same thing and vary the routine up across different types of training like cardio, weights, interval training, stretching and flexibility so that your body doesn’t get complacent and you can improve results. Applying this to your finances, spreading your savings across different assets like cash, bonds and shares in different companies, industries and countries can help reduce risks and optimise your investment performance. Group fitness and training sessions let you exercise together with your friends, giving you the added motivation to turn up (you don’t want to pike out on your mates) and work hard. You can also use your friends when it comes to saving up – there are apps like Unsplurge where you can all set a savings target and compete to see who can reach it first.